Hungry Lumas are pink, slightly chubby Lumas that have visible mouths (unlike regular Lumas) and appear in both Super Mario Galaxy and Super Mario Galaxy 2. Similar to Lumalee and Comet Tico, Hungry Lumas are always seen carrying two sticks (one in each hand) which will either have color-changing Star Bits or coins on the end, the latter appearing only in Super Mario Galaxy 2. When Mario finds a Hungry Luma, he must feed it a certain number of Star Bits or coins, making it larger and larger, until it transforms into a new planet or galaxy. Often, the player will be able to travel to the newly-created planet or galaxy via a pink Launch Star right after the Hungry Luma transforms. In Super Mario Galaxy 2, Hungry Lumas appear on the World Map. When called to Starship Mario and fed, it will turn into a new galaxy. Artwork of a Luma hungry for coins in Super Mario Galaxy 2. Players can also continue with the level as usual if they prefer to do so (the planet or galaxy will still be there the next time that area is visited). Hungry Lumas found throughout individual galaxies will usually require a smaller amount of Star Bits, as they only transform into planets, while Hungry Lumas that appear on the Comet Observatory or are called to Starship Mario will require larger amounts of Star Bits, as they create entire galaxies when fed. In Super Mario Galaxy, there are a total of seven Hungry Lumas that will appear on the Comet Observatory (one outside each dome and the Gate). In Super Mario Galaxy 2, seven more Hungry Lumas can be called to Starship Mario from each of the seven Worlds. There are a total of seven planet-forming Hungry Lumas as well as seven galaxy-forming Hungry Lumas in both Super Mario Galaxy and its sequel, resulting in a total of 28 Hungry Lumas altogether in both games. Two Hungry Lumas, a normal-sized one and one that is about to transform, also appear in Mario Golf: World Tour (as well as Mario Sports Superstars), making a cameo appearance in Rosalina's superb post-hole animations. However, one of the Hungry Lumas holds wands with a Life Mushroom and 1-Up Mushroom on them, like Lumalee does. 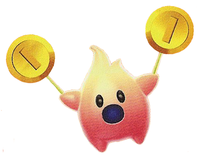 The Hungry Luma appears as a support spirit in Super Smash Bros. Ultimate, increasing the duration of transformation items when equipped. Artwork from Super Mario Galaxy 2. A Hungry Luma in the Good Egg Galaxy. Mario feeding Star Bits to a Hungry Luma. Hungry Lumas, alongside other Lumas and Rosalina, in Mario Golf: World Tour. The only Hungry Luma that will not leave behind a pink Launch Star after being fed is the one that transforms into the Van-Van Vanish Lv2 Zone in the Sea Slide Galaxy, as the planet is accessible by cannon. The only Hungry Luma that reverts to its Hungry Luma form after transforming is the one that transforms into the Tower Planet in the Good Egg Galaxy. This is because the Hungry Luma's transformation is actually a part of one of the main missions in the Good Egg Galaxy, as opposed to a hidden star mission. Therefore, the Hungry Luma must be fed 100 Star Bits to transform each time the level is replayed, as the planet will not remain after the level has been completed. Hungry Lumas are similar to Scoff from Donkey Kong 64 for both must be fed to progress. This page was last edited on January 10, 2019, at 22:51.